TAIPEI, Taiwan - In a tragic incident that took place in thecity of Taitung in Taiwan on Sunday, a train that runs on a line popular among tourists derailed and overturned, killing dozens and leaving scores of passengers injured. The Taiwan Railways Administration (TRA) said that all eight carriages of the Puyuma Express train derailed in the rural township of Tungshan, in the eastern Yilan county on Sunday evening. It said that five of the carriages flipped onto their side and that passengers within had suffered grave injuries on impact. The Puyuma Express 6432 service was reportedly travelling from a suburb of the capital city of Taipei towards Taitung city, which is on the country's southeast coast when it came off the tracks close to Xinma station, a popular weekend route. The Taiwan central government said in a statement that the train derailed on a curve near the town of Su'ao about 70 km (43 miles) from Taipei on Sunday evening at about 4.50 pm local time (08.50 GMT). It said that the train was carrying over 366 passengers when it went off the tracks. Speaking to reporters at the crash site, Jason Lu, head of the Taiwan Railways Administration said, "There are four carriages that were overturned at 90 degrees and the worst casualties were in those carriages. The exact cause of the accident is pending investigation." Shortly after the tragic accident, Taiwans United Daily News ran a live feed from the crash site, which showed emergency workers rushing to the spot and initiating efforts to rescue those trapped. Rescuers and emergency services were seen carrying bodies of victims and some of the bodies were wrapped in white plastic. As emergency teams began to arrive, media footage from the site showed some passengers trying to escape through train windows. Further, bystanders reportedly tried to help people out of overturned carriages by smashing windows. Witnesses told the local media that a loud noise was heard right before the accident and others said that they saw sparks and smoke emerging from near the train line before the speeding train shockingly overturned. According to one passenger who escaped from an overturned carriage was quoted as saying that the train had put on its "emergency brake" twice on the journey. The survivor further said that the train had suffered some problems with the electricity supply too. 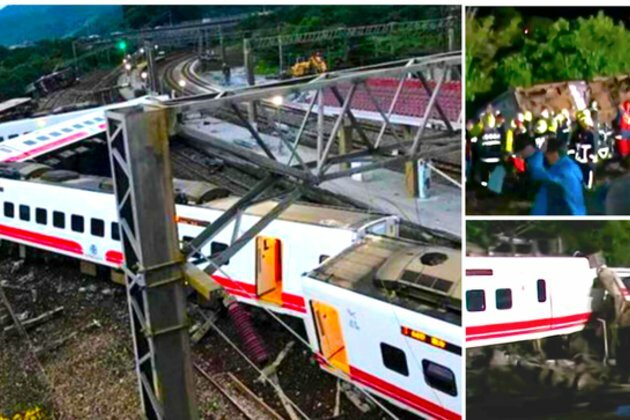 Another passenger quoted in Hong Kong's RTHK news said that the train had been preparing to accelerate before overturning and had been shaking intensely. The passenger added that some of the passengers were asleep at the time of the accident. Calling the accident a "major tragedy," Taiwan's leader, Tsai Ing-wen wrote in a post on Facebook and Twitter, "My thoughts are with all the victims and their families. We will use all our strength and efforts for the rescue." Meanwhile, hours after the incident, the office of Taiwan's Cabinet spokesman released the initial toll from the tragedy. The National Fire Agency cited the statement and said that 18 people had been killed and 160 others were injured. According to officials, 17 people who had suffered grave injuries died of cardiac arrest before they reached the hospital. Several other victims were being treated in four different hospitals. Chen Chung-chi, a spokesman for Taiwan's Ministry of National Defense meanwhile, pointed out that some passengers were crushed to death and "they died right away." He added that emergency workers were now removing bodies of the victims from the crash site and that the victims would now be identified. According to a government spokesman quoted in local reports, most of the deaths were in the first car, which completely flipped over at high speed. Later in the day, the Deputy Chief of the Taiwan Railways Administration Lu Chie-shen addressed a televised news conference and said that authorities had launched an investigation into the cause of the derailment. However, officials refused to comment on how many people could be trapped inside the train. Sunday's incident was ranked among the worst rail accidents on the island in over 20 years. While authorities refrained from commenting on the possible cause of the tragedy, questions were immediately raised on the condition of the Puyuma Express. Launched in 2013 to efficiently handle the complicated topography of Taiwans east coast, the Puyuma Express is one of the newer, faster trains in the country. The service came as a welcome addition since it is faster than any other rail service in Taiwan, apart from the high-speed rail that runs on the west coast. Trains on the Puyuma Express travel up to 150 kilometres (93 miles) per hour. Chieh-shen told reporters on Sunday that the train involved in the crash was only six years old and had been in "pretty good condition" before the accident. The Taiwan Railways Administration has revealed that the now-derailed Puyuma Express 6432 train underwent its most recent inspection in 2017. Further, the particular train also underwent major maintenancelast year. In an update late on Sunday, Taiwan's Central News Agency said that officials fear that dozens of passengers might still be trapped inside the overturned carriages of the train. According to a report in AFP, nearly four hours after the crash, at about 8 pm local time (12.00 GMT), more bodies were being removed from the damaged carriages. Meanwhile, the country's Defense ministry noted that 120 soldiers were working alongside firefighters and emergency workers to help speed up the rescue operation. While there was no official statement on the identities of the victims, a local media report noted that one of the victims was an American citizen. The rail authority has said that it is checking to see if any foreigners were on the train at the time and said that it would release details of the victims soon. Further, updated statements from officials said that the death toll had been revised to at least 22 people killed and 171 others injured. Over half a million passengers rely on Taiwan's extensive train network to commute across the country every day. In 1991, the country witnessed its worst rail accident, in which two trains collided in Miaoli, leaving 30 passengers killed and 112 others injured.